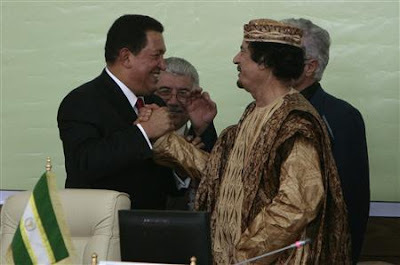 As Saif al-Islam Gaddafi threatens the revolutionaries with “rivers of blood” on the regime's behalf, one hopes Sean Penn and Oliver Stone will feel some indigestion over their buddy Hugo Chavez's relationship with Muammar. The fawning PR duo gives the Venezolano frequent, free, and favorable press, and also alleges that those of us who perceive him as more strong-man than people's man are blinded by a spell of propagandist haze. Venezuelan President Hugo Chavez was guest of honor at a military parade to kick off six days of festivities in Libya marking 40 years since Muammar Gaddafi took control of the desert country in a bloodless coup. Chavez swept into Tripoli's landmark Green Square to mix with dignitaries and joke with the press before greeting the veteran Libyan leader who arrived dressed in military uniform. The two leaders known for their anti-U.S. rhetoric hugged then sat together, flanked by African heads of state including Tunisia's Zine al Abidine Ben Ali and Algerian President Abdelaziz Bouteflika and dozens of army top brass. Military bands from 17 nations including France, Italy and Australia filed past as Italian aerobatic jets zoomed over the Mediterranean in Gaddafi's honor, trailing smoke in the red white and green of Italy's national flag. "thankfully few of us can picture President Obama hobnobbing with tyrants like these"